I love finding new ways to use items and supplies I already have in my craft room. For example, the Silhouette Temporary tattoo paper isn't just for skin! This stuff is amazingly versatile and can be used on wood and stone tiles! 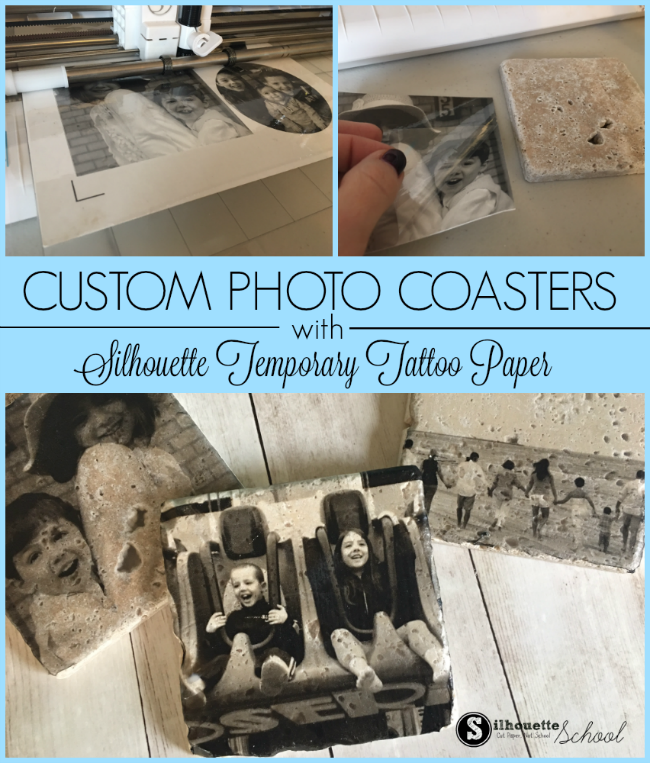 I have always loved photo coasters and the Silhouette temporary tattoo paper is perfect for this application. The first thing you want to do is measure your coaster - mine are 4x4. In Silhouette Studio use the Draw a Rectangle or Draw a Rounded Rectangle tool to draw out a square in the same size. Now you want to fill the shape with a photo - the process is slightly different depending on if you have Designer Edition or not. If you're unsure how to do this - this tutorial on filling a shape with a photo in Silhouette Studio will take you step by step. Because we printing and cutting these on the tattoo paper, we need to mirror the images. 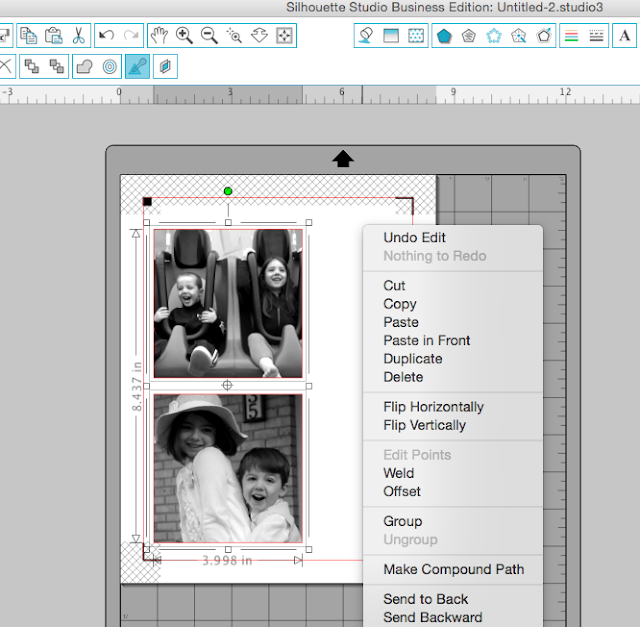 Select the designs > right click > flip horizontally. Now it's time to set up the page. 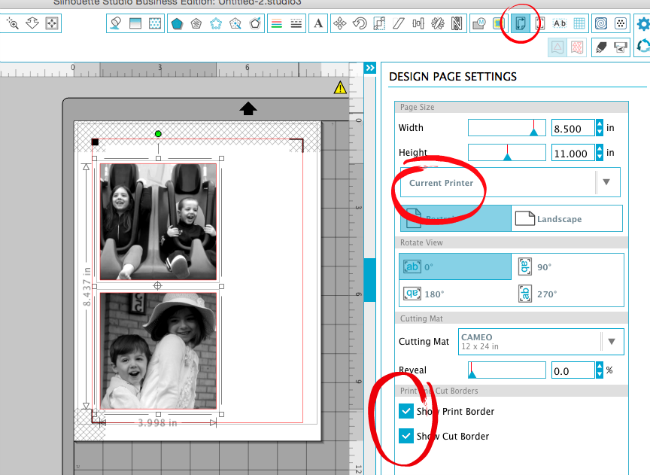 From the Design Page setting select "Current Printer." Make sure your photo coaster designs are inside the safe printing and safe cutting borders. Place a sheet of the white temporary tattoo paper in your printer. The more dull side is the back. Make sure you orient the paper so the other side will be printed on. Once it's finished printing, wait a few minutes to ensure the ink is dry. Grab the green sheet and remove the clear side from the green backing. Place the clear sheet over the printed tattoo sheet. Place the whole thing now onto your Silhouette cutting mat. In Silhouette Studio make sure you have selected Silhouette Temporary Tattoo sheets as the material type and adjust the cut settings and the blade. Send the design to cut. When the photo have finished cutting, remove them from the cutting mat. Carefully peel away the clear sheet from the photo which should now be sticky. Place the photo face down onto the tile coaster. Place a wet wash cloth on top of the entire coaster and printed tattoo and apply even and firm pressure for about 30 seconds. Peel away the paper backing leaving the temporary tattoo transfer behind. Be careful as the temporary tattoo material is slightly sticky and stretchy until it completely dries. Let the photo dry for about 24 hours. 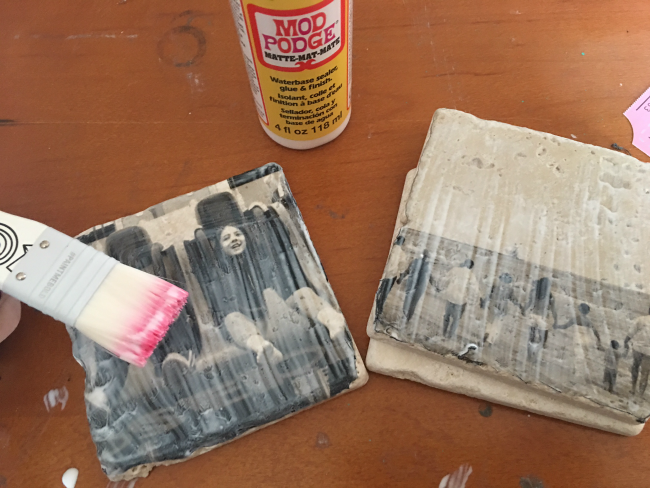 Then seal the coasters with Mod Podge to protect the temporary tattoo photo from water and use. Use a paint brush or a sponge brush to event apply the Mod Podge. Let it dry and then apply a second coat. Once the Mod Podge has dried, it will be clear. This should protect the photo transfer from any dampness or condensation from a glass that's placed on it. Note: You might want to add some foam, cork or rubber bumpers to the back side of the coasters to keep them from scratching the surface where they are placed.